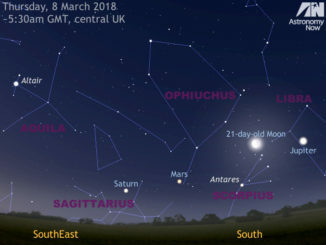 This graphic shows the appearance of the sky to the east-southeast at midnight for the beginning of May as seen from the heart of the British Isles. Arcturus, the brightest star in the northern celestial hemisphere, lies in the south almost 60 degrees, or three spans of an outstretched hand at arm’s length, from Vega in the east. 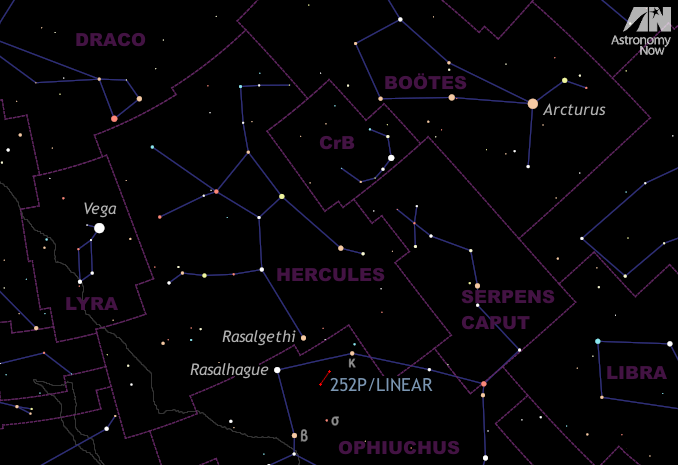 Between and below these readily identifiable stars lie Rasalhague in the constellation of Ophiuchus and Rasalgethi in Hercules — two stars that will fit within a low-power binocular field of view. Rasalhague and Rasalgethi form an equilateral triangle with Comet 252P/LINEAR. See the detailed finder chart for this region below. AN graphic by Ade Ashford. On the afternoon of 21 March, Comet 252P/LINEAR brushed by Earth just 14 lunar distances away. In the intervening 5½ weeks the comet’s rapid ascent into northern skies has slowed owing to its increasing separation from our planet and as its motion describes a graceful clockwise loop through northern Ophiuchus. On 10 May, 252P reaches a peak northerly declination of +9.1 degrees whereupon it starts to head south, still following an almost circular arc, crossing the constellation border into Hercules on 26 May. Now that this fascinating comet is visible from the UK low in the east before midnight, make the most of any clear skies you may have over the coming week to view 252P/LINEAR in a moonless sky before it fades below the range of binoculars and small telescopes. A periodic comet with a 5&frac13;-year orbit, 252P is currently about a quarter of an astronomical unit (~23 million miles) from Earth, but it can still be seen as a diffuse circular glow with minimal optical aid if you can find an observing location that is devoid of streetlights and other sources of artificial illumination. This detailed finder chart shows the nightly position of comet 252P/LINEAR at 12am BST over the coming week. It is a 4x enlargement of the wide-field view above and shows stars down to approximately magnitude +9. 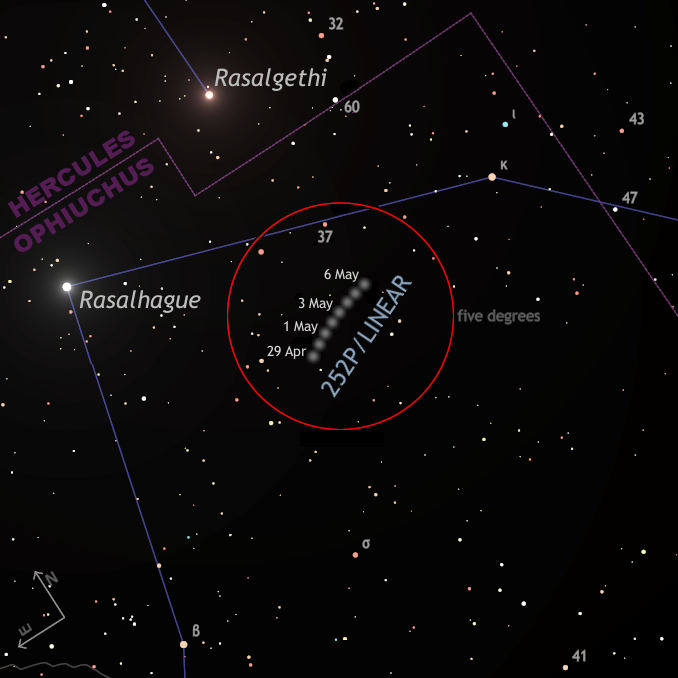 Rasalhague (α Ophiuchi) and Rasalgethi (α Herculis) lie 5¼ degrees apart. The red circle is five degrees in diameter, or the field of view of a typical 10×50 binocular. Click the graphic for a greyscale version of this finder chart suitable for printing and use outside. AN graphic by Ade Ashford. In the telescope, 252P presents a diffuse round coma about two-thirds of a degree across (somewhat larger than the full Moon in angular size) with virtually no tail. It’s still relatively bright, with an integrated magnitude of around +6.5, but fading. Astroimagers will readily capture its greenish-blue colour due to diatomic carbon (C2) molecules fluorescing in the sunlight. This daily topocentric ephemeris of 252P/LINEAR is computed for 12am BST on the dates shown for the centre of the British Isles. Observers in the UK with computerised GoTo mounts or digital settings circles can therefore enter the J2000.0 epoch coordinates directly. The stated integrated magnitudes are conservative estimates. 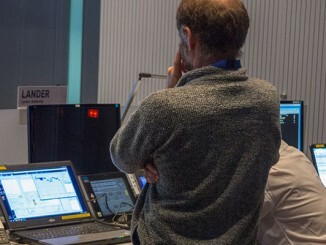 Computing credit: JPL’s HORIZONS system. Find out all you need to know about observing Comet 252P/LINEAR and the other solar system bodies currently in the night sky in the May 2016 edition of Astronomy Now. Mars lies highest in the sky to the south soon after sunset at the beginning of July for observers in the UK, so you should not waste any opportunities to view the Red Planet while it is close and still relatively large in size. 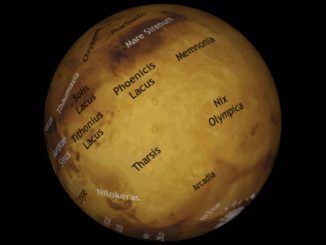 Tharsis, the great Martian volcanic plateau that is home to the largest volcanoes in the solar system, is turned toward Earth in the first week of the month.